David Hall, Michael Sherman and Ron Guth will give expert advice during PCGS grading seminars at the June 2015 Long Beach Expo. Photo by Donn Pearlman. (Long Beach, California) -- Professional Coin Grading Service (www.PCGS.com) experts will conduct three grading seminars, including one for young numismatists, at the June 4 - 6, 2015 Long Beach Expo Coin, Currency, Stamp & Sports Collectible Show (www.LongBeachExpo.com). "The last time we offered grading classes, the advance reservations quickly filled up the limited available space. We anticipate that will happen again this time, well before the May 31 reservation deadline, because each seminar is limited to only 30 participants," said PCGS President Don Willis. The three classes that will be conducted at the June Long Beach Expo will be "Grading 101: Introduction to Mint State and Circulated Coin Grading;" "Grading 102: Qualifiers, Proof Coins, Modern Coins and Difficult-to-Grade Coins;" and "Coin Grading For Young Numismatists." Grading 101 and 102 will be held on Saturday, June 6, from 10:00 AM to 2:00 PM with lunch provided. Grading 101 will be taught by PCGS CoinFacts President Ron Guth and Grading 102 will be instructed by PCGS Director of Collector Education Michael Sherman. PCGS Co-Founder David Hall will participate in question and answer sessions at both seminars. The "Coin Grading For Young Numismatists" class will be held from 9:00 AM to 9:45 AM on Saturday, June 6, and is open to young numismatists ages 16 and younger. Those young collectors attending the seminar may be accompanied by one parent or guardian. All seminar participants will receive a certificate of completion and a digital copy of the seminar slide presentation as a reference tool. 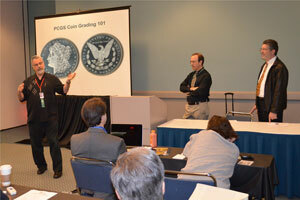 The cost of the Grading 101 and 102 seminars are $149 for PCGS Collectors Club members and $199 for non members. Space is limited to the first 30 registrants and the deadline for registering for all seminars is May 31. To register, visit the PCGS Online Store at www.PCGS.com/store. There will be free admission for the Coin Grading For Young Numismatists seminar, but again, the course is limited to the first 30 participants. Parents must call PCGS at (800) 447-8848 to reserve a spot no later than May 31. The Grading 101 class will cover the elements that go into grading Mint State and circulated coins, along with tips and techniques used by professionals. Participants will be given the opportunity to put what they’ve learned to use by grading approximately 50 Mint State and circulated coins. Following a break for lunch (provided by PCGS), the grading test will be discussed, and participants can review their results against actual PCGS grades to see in what areas they might need further instruction or improvement. Grading 102 will cover Qualifiers (color on copper coins, strike on silver and nickel coins and proof-like and cameo surfaces). Grading Proof coins will be discussed along with ultra-high grade modern coins and some difficult-to-grade series, such as Indian gold coins. After a break for lunch (provided by PCGS), coins will be available to view and discuss, and a question and answer session will follow. The Coin Grading for Young Numismatists course explains the basics of coin grading to the next generation of collectors. The students will be taught the basic elements of grading, how to grade Mint State and circulated coins, and the proper techniques for reviewing coins.